Power of the Daleks to be animated and released on DVD! [Update: Maybe not...] Update x2: HELL YES, IT IS! Attention classic Doctor Who fans: The Mirror just confirmed announced that BBC Worldwide have commissioned an animated reconstruction of the very first 6-part Patrick Troughton story Power of the Daleks, for which no surviving episodes still exist! UPDATE: The Mirror article doesn’t provide any sources, and BBC Worldwide have yet to make an official comment to anyone who’s asked, so it’s beginning to look like they saw the same YouTube clip I did, and jumped to conclusions... two weeks after everyone else. Keep in mind, this is also the newspaper who reported that all 7 episodes of Marco Polo had been found back in 2013, and look where that got us. Backing up a bit, these rumors of an animated Power of the Daleks DVD began to circulate after a short animation test was “leaked” onto YouTube a couple of weeks ago. The video was subsequently pulled at the behest of BBC Worldwide, but not before thousands of fans had seen it, myself included. I initially dismissed it as a hoax, because the footage bore a very close resemblance to this clip, created by a homegrown Fanimator, Rob Ritchie, who has been responsible for several amazing bits of Whonimation over the years. 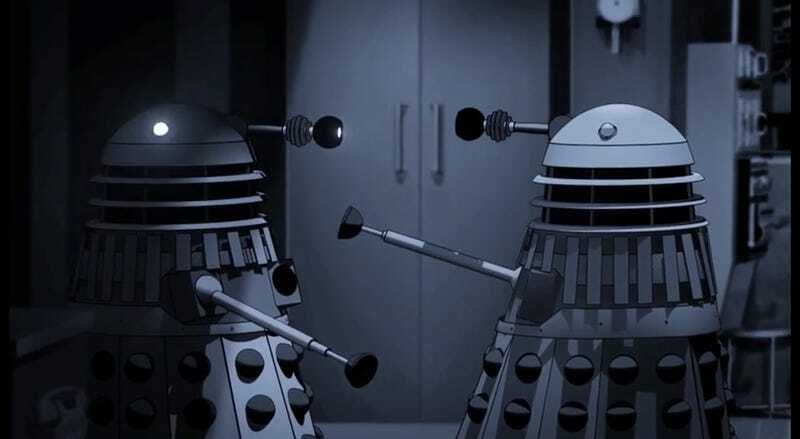 The purported “test animation” we saw was significantly more polished and longer than the clip above, containing shots of both The Doctor’s “I’ve seen the misery they’ve caused, the destruction...” speech with his 500 Year Diary, and Lesterton’s terrified discovery of the hidden Dalek assembly line from the end of episode 4. Visually, I’d say it was closest to the animation used during the DVD reconstruction of The Invasion, than anything else we’ve seen thus far. I just assumed that Ritchie had improved on to his earlier test footage from four years ago, but if it turns out to be real, it’s not terribly surprising that they’d look very similar, given that all the animation is based off the same preexisting telesnap archives. November to December of this year would mark the 50th anniversary of the story, so if BBC Worldwide have been keeping the whole thing under wraps with the intention of springing it on us as an early Christmas surprise, it’s just barely possible that we might see a digital iTunes release first in time for the 50th, followed by an official DVD release later the next year (the same way we got Web of Fear and Enemy of the World), but realistically, it’d probably be 2017 or 2018, especially if the project was just commissioned. Either way, this could be great news for classic Who fans, and there’s still hope yet that we may eventually see DVD releases for all the missing episodes, even those for whom no video still exists.